This is a 3 Gallon Kit of Sprayable bedliner that will cover up to 100 SQ FT. 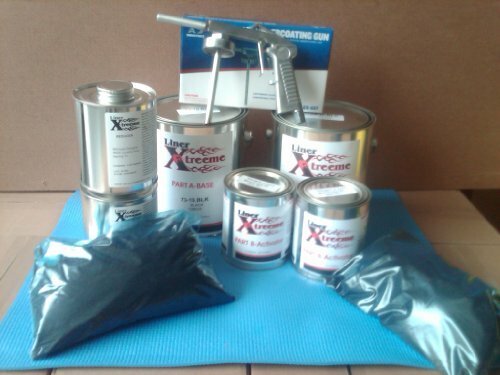 This kit is Black Only and includes a spray gun and 2 reducer cans that double as cups for the gun. Will do two short bed trucks or one 8 foot bed in PROFESSIONAL Quality. Jeep, Truck, Boat and ATV owners Love this product for durability and looks. This Kit is a semi - gloss finish that will outlast all others. Our professional users compete against Line-X and Rhino everyday! If you have any questions about this product by LinerXtreeme, contact us by completing and submitting the form below. If you are looking for a specif part number, please include it with your message.